The full six-man team comes together. Lots of news this week. 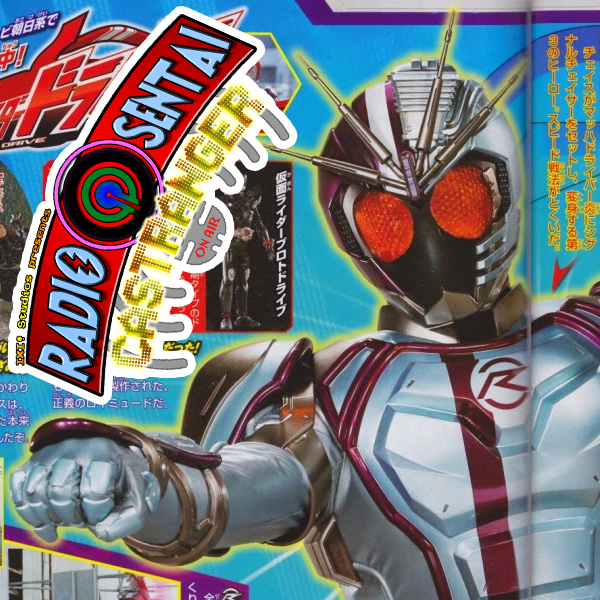 We argue quite divisively about Kamen Rider Chaser's fully revealed suit. Drive Type High Speed becomes a gentleman, the identity of ToQ-7gou is ACTUALLY revealed, quite to our surprise, as well as the identity of Starninger, and three veterans cameo on Ninninger soon. We then talk about this week's episodes: Kiriko violently nurses Chase, Type Formula goes for a Pit Stop, and Gou pumps iron and gets super jelly. Meanwhile in Ninninger, Kasumi and Yakumo struggle to hold the spotlight as this week's kind-seeming monster hands kids balloons, and we get a visitor from space. Finally, our topic of the week is the ToQger-Kyoryuger movie, which takes two shows about really abstract concepts that force-feed themselves into tangibility and literally cross the streams, as they fight the villain that was hinted at, at the end of the Kyoryuger series. When two derpy teams collide, the result is a rainbow-colored hilarious disaster.